Are booming bioplastics here to stay? 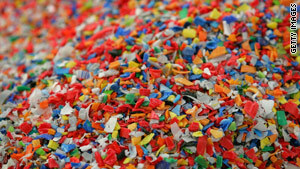 Recycling plastics like PET can be effective, but the scope for bio-plastic is vast as new tech aids their versitlity. (CNN) -- As world leaders and their delegates trod the carpet thin at the United Nations climate summit in Copenhagen last week, one environmental solution to reduce greenhouse gas emissions was literally under their feet. The 215,000-square-feet carpet at the Bella Center that hosted most of the U.N.'s official events was made using Ingeo, a bio-fibre derived from corn sugars. According to French manufacturer Sommer Needlepunch and Natureworks LLC, the provider of Ingeo, in shunning oil-based products the carpet saved the emissions equivalent of driving an average car 68,869 miles (110,834 kilometers). It is one small step in a bioplastics and biofibers industry that is fast developing new alternatives to oil-based polymers and turning them into everything from food packaging to fashion outfits, cell phone casings and medical implants that dissolve inside the body. Henry Ford theatrically swung an ax to show the dent resistance of soy-based car doors at Ford in 1940, when the infant science was called "chemurgy." So far, bioplastics only comprise an estimated 0.20 percent to 0.25 percent of total plastics use. But several forecasts predict a boom for the once-brittle plastics that are now beginning to compete with traditional PET and polystyrene. A recent University of Utrecht study forecast that up to 90 percent of plastics could technically become bio-based in the long term and that production could grow by on average 37 percent annually until 2013. Ceresana Research predicts the largest growth rates in electronics and auto industries. The Freedonia Group, an industrial research company, sees demand growing fastest in the Asia-Pacific region, and some predict the U.S. market to reach $10 billion a year by 2020, a tenfold increase from 2007. The most recent scientific breakthrough came from researchers at South Korea's pioneering Korea Advanced Institute of Science and Technology (KAIST). They used a metabolically engineered strain of E. Coli bacteria to produce bioplastic polymers through single-stage fermentation, potentially cutting the cost of the usually expensive process by about 40 percent when the new science is market ready within about two years, according to Professor Sangyup Lee, who led the team of scientists. "We're basically torturing E.Coli but in a way that will benefit human beings and environments," Lee told CNN.com. Such achievements take time, Lee said, estimating that the latest advance took the equivalent of 10 people working for five years. But metabolic engineering has created new pathways that allow the science to be broadly used. "We produce buildings blocks for the existing chemical industries so they don't get frustrated," Lee said. The bioplastics market has swayed to the price of oil. "The general rule of thumb, if oil gets above $70-$80 a barrel, it gets very easy to compete on a price basis," said Steve Davies, director of Communications and Public Affairs at Natureworks, which owns the world's largest bioplastics facility. U.S. company Metabolix recently launched a plant in Iowa to produce more than 50,000 tons per year of its new niche biopolymer Mirel, in a joint venture with agribusiness giant Archer Daniels Midland. It is pricing Mirel at a premium fit for a game-changer, Dr. Oliver Peoples, Metabolix chief scientific officer and vice president of research, told CNN. "There's been a lot of overpromising and underdelivering," Peoples said. "The reality is that anyone who tells you we're going to make this bioplastic for 30 cents per pound based on fermentation technology or cellular sugars is, basically, completely conning you. We're not betting that petroleum will be $200 barrel." The menu of ingredients in the biomass used to make the plastics is growing -- corn, wheat, potatoes, tapioca, soy, sugarcane and wood are in the production cycle. Metabolix is exploring switchgrass, industrial oil seed and has been trialing tobacco crops. Algae is favored for its high yield and oil giant Exxon Mobil this year bought into its potential to produce 2,000 gallons of fuel per acre. That's almost 10 times as much as corn, which remains the cheapest and most widely used feedstock for biomass. Both Natureworks and Metabolix companies see the future in cellulosics such as grasses and non-edible plant parts. "Crops like sugar cane and switchgrass have the potential to grow in acres where crops can't be grown or those grown are of marginal value," Peoples said. "It really allows you to produce bio-based, bio-degradeable materials from agriculture without impacting food." Davies also champions cellulosics: "If you look at our 140,000 tons at full capacity, we would use less than a tenth of the percent of the U.S. corn. We'll get big by getting more competitive in pricing, which means moving to cellulosics." Even at competitive cost, bioplastics companies must persuade critics and those confused about how environmentally friendly the different kinds of bio-plastics really are. "People don't like to deal with complexity. And the answers to all these questions is often: 'it depends'," Reid Lifset, an associate research scholar at Yale School of Forestry and Environmental Studies and editor-in-chief of the Journal of Industrial Ecology, told CNN. Natureworks' PLAs can be chemically composted into lactic acid and then produce virgin polymer for new products -- yet the composting is still on a post-industrial scale and not widely available for ordinary households. Metabolix produces a different type, polyhydroxyalkanoates (PHAs), which Peoples said will readily bio-degrade in home composting and even in cold oceans. Lack of composting facilities could push bioplastics into landfills, where certain types would release more damaging methane than traditional PET plastics. Worries that bio-plastics could contaminate the PET recycling stream has some retailers hesitating. The impact also depends on other difficult variables, including each product's lifespan. Market growth, stricter government standards for plastics and limits on land filling are encouraging more research into improvements and solutions, but bio-plastics will not be a miracle cure in an "either-or" scenario with oil-based plastics, producers and experts say. "PET recycling is already very good. Our attitude is that Mirel should be used where it actually makes good sense and not to replace something where there already is a good system," said Peoples. Said Davies: "Bio-plastics can go somewhere at the end of their life, there are many exciting options for the future,"
"Infrastructure will need to broaden to realize that, but that needn't be an impediment for people to use the plastics today." Lee has a simple immediate solution: use less packaging overall.